Now that Yandex is a public company there is much speculation about which markets the search engine known as Russia’s Google plans to expand into next. 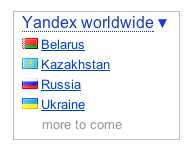 Andy Atkins-Krüger has written a great post on how Yandex is doing in Russia and beyond. It’s a must read if you want to learn more about the Russian Google and where it’s headed.